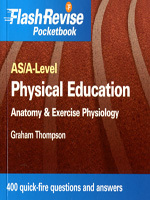 Flash Revise Pocketbooks are ideal for quick revision. Written by a subject expert for instant revision of key topics to help you achieve the very best grades, they provide quick-fire questions and answers with exam tips. With content organised in easy-to-follow sections, Flash Revise Pocketbooks are the answer to instant revision anytime, anywhere! Flash Revise your subject now! ...and then why not test your friends?